Believe it or not, your fly line is the most important part of your gear. A good quality line will cast well on both an expensive or cheap rod. So don't skimp on the line. If you need to save money, by a less expensive rod or reel, but make sure you buy a good quality line. Manufacturers use the same designation for fly lines based on the taper of the line. Taper is the change in diameter of the line. Lines can be classified as double taper, weight forward, level, and triangle taper. Lines are designated by weight and designed to work with the corresponding weight rod and reel. While the designation of fly lines may be the same between manufacturers, there are some differences between lines. Manufacturers may use different materials and different structural designs for floatation. They use different coatings to make the lines harder or softer. Most fly lines are floating lines, but manufacturers also make sinking lines for fishing nymphs in deep water or lakes. Double Taper (DT) Lines – Double taper lines are tapered on both ends of the line. You can reverse the line on the reel when one end begins to crack or is worn and you essentially have a new line. Double taper lines have a more gradual taper than weight forward lines. This design increases the precision of the cast and gently lies down on the water. Because of this, double taper lines are a good choice for beginners. Weight Forward (WF) Lines – Weight forward lines have a section of the largest taper near the end of the line. This puts most of the mass at the end of the line allowing anglers to more easily and quickly load their rod for more casting power. This translates into longer casts. However, the fly presentation may not be as gentle as a double taper line. Make sure to match your line weight with the type of fishing you will be doing and to the rod and reel size. Also, weight forward lines can be matched to the action of your rod. They are made for slow, medium, and fast action rods. Level Lines – Level lines have the diameter thickness throughout the line. These are the most inexpensive lines and are hard to cast and not as accurate as double taper or weight forward lines. Triangle Taper – Triangle taper lines have a gradual taper increasing in diameter from the tip of the line to about 25 to 40 feet. It then necks down to a level line. It provides the mass for long accurate casts, but also gives gentle presentations because most of the mass is away from the fly. 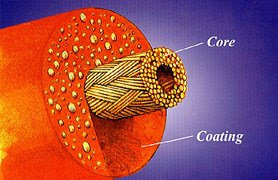 Backing – Backing is a inexpensive cord like material wound on the spool of the reel before the line. Your fly line is attached to the backing. The backing provides several purposes. It fills the spool to its capacity making it easier to reel.It also provides backup line in case a big fish runs and takes all your line off your spool. 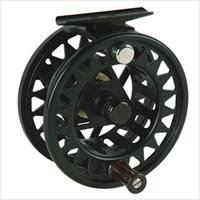 Reel manufacturers will recommend the type and length of backing needed to fill your spool. Rods, lines, and reels are all matched by "weight" to more accurately and easily present your fly and give you the necessary casting distance. It all starts with the line weight for your particular type of fishing. Rods are designed to cast or a specific line weight while reels are designed to hold specific weight lines. Smaller weight combinations (2 to 4 weight) are generally used to catch small fish. Medium size combos (5 or 6 weight) are good for fishing rivers and lakes where you may catch fish up to 4 or 5 pounds. Larger weights are good for those big lunkers.